In the early 1990s, Alizabeth Newman was a young immigration attorney overwhelmed with the demand for legal assistance stemming from events that began a decade earlier. An influx of mostly Spanish-speaking, immigrants fleeing political unrest in El Salvador, Guatemala and Honduras in the 1980s had arrived on Long Island, and many of them, women especially, ended up at Newman's workplace -- the Central American Refugee Center (CARECEN), a nonprofit immigration and human rights organization based in Hempstead. "Women were coming in with different kinds of needs," she said. "Some were escaping domestic violence and sexual assault." Besides that, many had language and family issues. Not knowing their rights, they rarely sought help and were fearful because of their undocumented status. “Apart from asylum, we weren’t set up to do anything else,” Newman said. "We were saying somebody ought to do something, but there was nobody." Newman decided to become that somebody. She wanted a place where immigrant Latinas could meet and feel safe talking about their concerns. "The Long Island Fund for Women (now the Long Island Women's Fund) gave me a small grant to start something," Newman, who lives in Long Beach, recalled. "I asked my boss if I could work half a day, and half a day became one day, one day became full time. I gathered a group of Central American women from the community and we started talking and brainstorming about what we could do." What they did was create SEPA Mujer -- Services for the Advancement of Women -- in 1993. The nonprofit, which began in Hempstead and is now based in Islandia, serves about 1,000 clients, who are a mix of documented women and those living here illegally. SEPA Mujer was formally incorporated in 1997, and its mission is to educate and empower immigrant Latinas to improve their own lives and become active in the community as leaders, helping other immigrants. Newman brought in experts to talk to the women about their rights as immigrants and women, their rights in the workplace and domestic violence laws. They learned how to advocate and speak in public. "Newer immigrants are without resources," Newman said. "They're a very vulnerable group." SEPA Mujer also provided legal representation for the women, some of whom came from Honduras, Mexico, Chile, Ecuador, the Dominican Republic, Colombia and Costa Rica. The agency partnered with other organizations on Long Island to provide housing and social services, and help register the women's children for school. As the immigrant population grew and became concentrated in Hempstead, Westbury, Brentwood, Central Islip and Patchogue, SEPA Mujer helped the newcomers get accustomed to American culture while helping Long Islanders interact effectively with them. SEPA Mujer has a small staff that works alongside its volunteers, who number about 100 and are mostly clients the agency once assisted. They include social workers, legal aid workers, "just mostly immigrant women who want to give back," Newman said. "Volunteers teach all sorts of classes based on their skills. They support women going to Family Court, hospitals, and seeking police assistance." Besides the group's executive director Martha Maffei, the nonprofit employs an immigration attorney and a community organizer. "We couldn't do this job without our volunteers," said Maffei, 43, of Middle Island. She said she would like to see all government agencies provide services for people with limited English proficiency. "Latina populations are growing on Long Island," Maffei said. "Services are not culturally adapted for newcomers who don't speak the language and don't understand the culture. Immigrant communities go for our services because they know we speak the language, we're from the same culture, we're women and have the same needs and problems." Maffei was nominated as "Latina of the Year" by the magazine USA Mujer Actual in 2011. In May, she will receive a community leadership award from Long Island Latino Magazine. The group's volunteers have also been recognized for their work with SEPA Mujer. In 2010, the Fund for Modern Courts -- a reform organization that seeks to improve New York State's judicial system -- presented the nonprofit's volunteers with the Samuel J. Duboff Memorial Award in recognition of their work with Hispanic immigrant women and domestic violence survivors. In 2014, during Hispanic Heritage Month, Suffolk County Executive Steve Bellone recognized SEPA Mujer volunteers' community contributions. Volunteers participate in women's rights campaigns and marches to Albany and Washington, D.C., to lobby for immigrants' rights, and they join other groups at rallies such as a recent demonstration in Bay Shore to protest police brutality. Every year in October, which is Domestic Violence Awareness Month, the nonprofit holds a candlelight vigil in front of Family Court in Central Islip. Extending its outreach to Latinas on Long Island's East End, SEPA Mujer meets with a group in Hampton Bays called Mujeras Sin Fronteras, or Women Without Borders. "Other nonprofit organizations ask us to make presentations in libraries and churches," Maffei said. "Hospitals, police, the county and the courts refer people to us for services. . . . We are part of coalitions that promote change. We bring women's needs to the table." One of those women is Cristina Reinosa, 48, of North Babylon. She is a mother of three and a former client who began volunteering with SEPA Mujer in 2012. Reinosa came to the United States from Colombia on a tourist visa 26 years ago. She became a permanent resident in 2013 and said she helps SEPA Mujer whenever she is needed. "Whenever they have activities and marches I participate, and I make calls to motivate people to vote," Reinosa said through an interpreter. "When I can I go and help them because they help many women. I know who I am now, because I was lost." 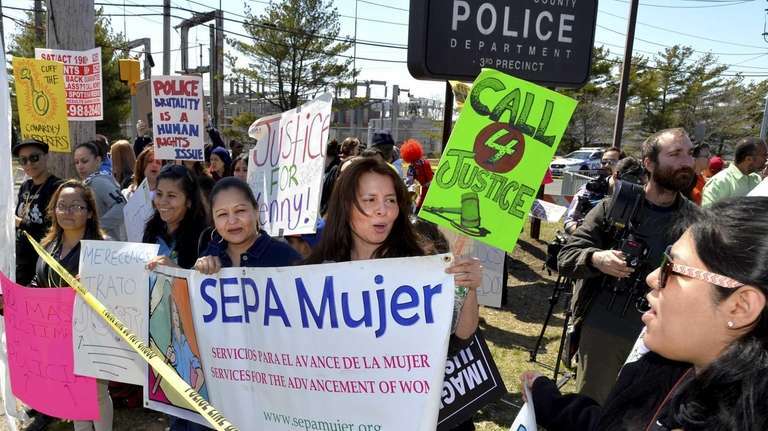 Elida Alsaro, 28, of Brentwood, a mother of four from El Salvador, said she sought legal representation from SEPA Mujer in a domestic violence case. As a volunteer for the agency, she participates in community events and trips to Albany and Washington to lobby for laws that affect women. "I volunteer, because I have the opportunity to provide information to other women so they won't be in the shadows like I was," Alsaro said. Thanks to SEPA Mujer, Elizabeth Aguilar, 38, a Bay Shore resident and single mother of two boys, was able to reunite three years ago with her eldest, Kevin, 19, whom she had to leave in Honduras. Aguilar has volunteered for SEPA Mujer since 2010. Kevin -- who taught himself English -- also volunteers with the nonprofit. "We participate in many different activities to help the organization," he said. "As long as she lives in New York she will volunteer," Kevin said of his mother. "And I want to get involved even more. I want to teach the new kids how to speak English." Though Newman is no longer involved in SEPA Mujer's day-to-day activities -- since 2000 she has been a clinical professor of law at Stony Brook University -- she has stayed on as a board member and also mentors SEPA Mujer's new volunteer attorneys. She has ideas about the nonprofit's future. "What we would really love to have are satellite offices all over Long Island where there are people trained and resourced and there is always access to information and support," Newman said. "The need initially was on a more survival basis," she said of SEPA Mujer's early goals. "And now it's developing a collective voice for this community. When you bring women together, really good things happen."